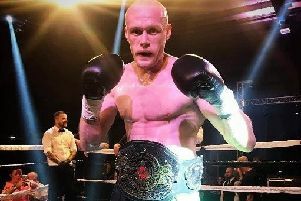 Two-time English UBBF champion Seamus Devlin will make history at the weekend when he promotes his first ever show in the bare knuckle boxing industry. Not only will the 30-year-old be looking to add another strap to his impressive collection at Colne Municipal Hall on Sunday, but he’ll also be exhibiting the first ever female title fight in the UK. The gloves will be off, literally, when Ella Mac and Sara Smith headline the 10-fight event, which is only the second contest of its kind worldwide. Seamus, who will go up against Mikey McGowan in a light-middleweight BKB battle, said: “I’ve been working on it day and night to get everything sorted. It’s not been easy - we’ve had fighters pull out, injuries etc - but we’re on track. “There are 10 fights on the card - two gloved exhibitions and eight bare knuckle contests. That also includes the first bare knuckle UK Women’s title fight. “There has been one in America but we’ll be the second to do it in the mainstream. It’s a big thing. We are making history. It’s huge. “I don’t know why nobody else has taken that step. There seemed no place for women in the sport at the time but I’m looking to buck the trend. “This sport is actually safer than boxing. But this represents more than just a spectacle for Seamus, who reigned at 77kg in the UBBF (United British Boxing Federation). The former St Augustine’s RC High School pupil, who has lived in Padiham for most of his life, had lost his way in the world during his 20s. Addicted to drugs, homeless and unemployed, there appeared to be little hope of salvation. At the end of his tether, struggling mentally and physically, Seamus planned a return to Portadown, Northern Ireland, where he had briefly lived during his teenage years. However, fate intervened. After seeing an advert from Shaun Smith, renowned to be the nation’s scariest debt collector, Seamus made the decision to join the Muscle House Gym in Warrington to train. Sleeping on floors and travelling around the country under the UBKB (Ultimate Bare Knuckle Boxing) umbrella, Seamus began his reawakening. Now with close friend and co-promoter Baz Neil, representing Lacey’s Gym in Farnworth, he said: “I only got in to boxing two years ago but I’m a very driven person. “I won’t stop until I’ve achieved everything that I want to achieve. I had no experience at all. I had a drug addiction in my 20s. “I lost my house and my job and I was living in a shed. I was going to jump on a ferry back to Ireland but things changed. “I’ve fought with lions and swam with piranhas to get here. The guys at Muscle House and UBKB gave me my first shot. They got me started in this sport. I’ve got a lot of respect for them. “I was a massive fan of boxing but I’d never stepped in to a ring or laced up any gloves. I couldn’t even throw a jab. Also on the card is Baz Neil v Shane Sloman, Lloyd Baldwin v Jake Watkins, Lloyd Riding v Tom Briggs, Marley Tomlinson v Alec Cunningham, Paul Morris v Ben Waddington and Brent Doney v Ady Rampling while Brummie Ash D v Tommy Layfield and Dale Johnson v Craig Fletcher open the show in gloved fights. Doors open at 3-30 p.m. and the first bout is scheduled for 4-30 p.m. Tickets are still available, priced at £50 for VIP, £35 for seated and £20 on the door. For more information contact Seamus on 07888 955932. “I’ve achieved everything that I want to achieve in gloves,” he said. “I’m getting recognised and people have tried to get me to turn professional. I’m looking to retire if I win this one though. “The journey has just started in terms of the bigger picture. I’m in the best shape of my life for this fight and I’m quite excited for what’s ahead of me. I’m very optimistic.